Southern League Premier Champions Hereford will be the visitors on Saturday (kick off 3pm) for a very special occasion at the Aspray Arena. This fixture marks the first game at the Noose Lane venue since the completion of a £1m revamp of the stadium and playing facilities. 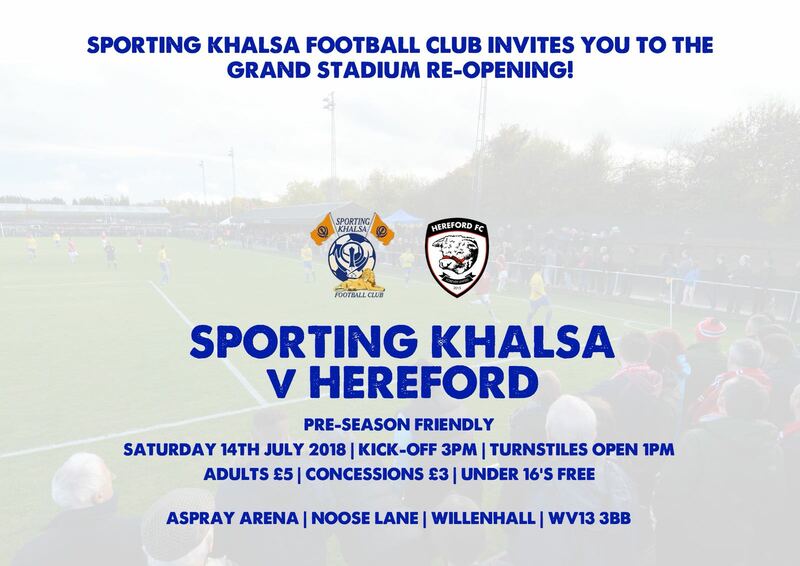 Hereford are familiar opponents for Khalsa. After being reborn from the ashes of Hereford United, the club were placed in Midland Football League for the 2015-16 season, the first step of a journey which will surely see them regain their Football League status. Winning the division in comfortable fashion, Hereford twice put Khalsa to the sword. First in February 2016, the Bulls won 4-0 at Edgar Street thanks to a virtuoso hat-trick performance by Sierra Leone magician Mustapha Bundu. In the return fixture, Hereford – already confirmed as champions – won 3-0. That season, Hereford also reached the final of the FA Vase, losing 4-1 to Morpeth at Wembley. Since waving goodbye to Khalsa, Hereford’s march has not missed a step. They romped to promotion from the Southern League South and West before winning their third championship in a row last season to take the Southern League Premier title. Now a National League North outfit, Hereford are well on their way back to the status they enjoyed before the demise of Hereford United. Pete Beadle’s side have already begun their pre-season, winning 5-0 at West Midlands Regional League neighbours Pegasus Juniors and following this up with a 3-0 win at Southern League Division One West outfit Cirencester Town.